The Lansdale Signature Service Oil Change helps maintain the value of your vehicle by helping you keep it in top performing condition. The when you get your oil changed at Lansdale Automotive, are doing it at a full service, auto repair shop filled with people who know more about cars and light trucks than “just where the oil drain plug is”, we also help you by heading off problems before they happen. With as much as you paid for your vehicle, you want to keep it on the road as long as possible. That’s why we offer oil change services. It’s more than simply an oil change, it’s preventive maintenance to change, inspect, check/fill and clean, essential components of your vehicle and help keep it all running smoothly. By taking care of your vehicle with an oil change at a full service garage, you’ll be getting the peace of mind that your vehicle will be with you for a long time. 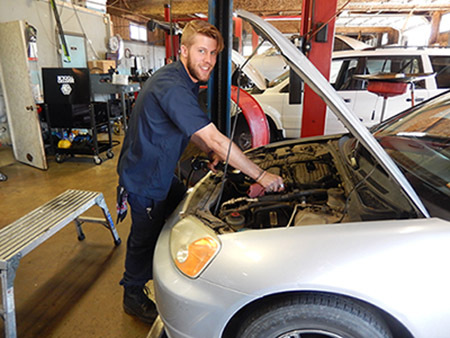 Every day Lansdale Automotive services many vehicles in the Georgetown area. On an individual basis, we help customers select the motor oil that is right for their vehicle. In this article you will find the answers to some of the most common questions that we encounter when it comes to truly understanding oil. Why does my vehicle even need oil? Did you know that some of the moving parts within your engine never really touch? It is true! They ride on a thin film of oil. One of the main functions of oil is to keep these moving parts separated from each other, preventing damage and wear. Another important function of oil is cooling. As the oil circulates it carries away some of the heat generated as a result of the combustion process. When your motor oil level is low it will cause the engine temperature to rise. It is important to check your motor oil level frequently to make sure that this doesn’t occur. Did you know that motor oil also plays an important role in helping to keep your engine clean? The oil within your engine is constantly cleaning as it lubricates picking-up and holding dirt, contaminants and other combustion by-products. Think of motor oil like you would think of a sponge. We all know that a sponge has the ability to pick-up and hold fluids, dirt, etc. When a sponge becomes oversaturated it can no longer hold any more fluid. These same attributes apply to your motor oil. When the oil becomes saturated with contaminants, and cannot hold anymore in suspension, the excess falls-out of suspension and can form deposits in the engine, one of which is known as sludge. Regular oil changes will remove suspended contaminants before sludge can form, helping keep your engine running cleaner and smoother. When do I need an oil change? How do I choose the right type of oil? You want to get your oil changed before sludge starts to form. Remember, sludge is one of the top enemies of your engine, so you want to take action before sludge takes over. The timing of oil changes can vary depending on the type of vehicle you drive, where you drive, and how you drive. Your vehicle manufacturer has done rigorous testing to help determine the timing between oil changes and the proper oil. All of this information can be found in your vehicle owner’s manual or you can easily stop by Lansdale Automotive where a trained technician can help. SAE 10W-30? SAE 5W-40? What are these numbers and letters? The numbers come from a standardized industry scale from the SAE (Society of Automotive Engineers) to describe how well an oil flows (viscosity) through an engine when the engine is cold in the morning and when the engine is warmed up and working hard. The most important thing to remember is to match this number to what is recommended in your vehicle owner’s manual. Most motor oils today have two numbers (multi-viscosity): for example, SAE 10W-30. The low number with the W (stands for Winter), or cold temperature number, relates to how well the oil can be pumped or pushed through the engine at certain cold temperatures. The second number (in this example 30) relates to how well the oil flows at higher engine temperatures. When your engine heats-up the motor oil gets thinner. Problems can arise when the motor oil gets too thin and can no longer keep some of the moving parts separated by the oil. So your oil is always maintaining a delicate balance: it needs to flow well when the engine is cold but also maintain an oil film at higher temperatures to keep metal parts lubricated and separated. Be careful: higher or lower viscosity numbers may not be compatible with your engine. To find out what oil grade is right for your engine, check your vehicle owner’s manual.